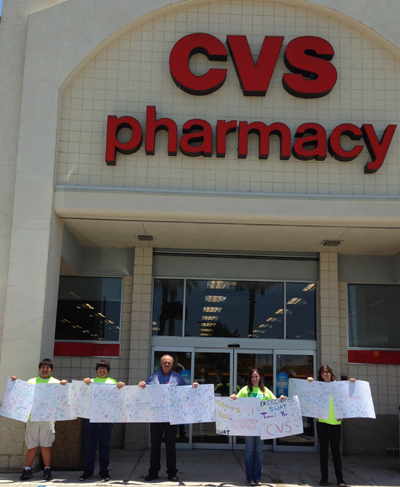 Okeechobee Students Working Against Tobacco (SWAT) Chapter Says "Thank You CVS"
In observance of World No Tobacco Day the Okeechobee SWAT Chapter performed a Thank You project for our local CVS Store. The Okeechobee SWAT Chapter created 14 posters and obtained a total of over 700 signatures, to Thank CVS for stopping the sale of tobacco products in October of 2014. The SWAT students presented the posters to the local Store Manager, and stated that they wanted to recognize the store for taking the first step to stop the sale of tobacco products. The SWAT youth recognized that although this might decrease their overall monetary profits from a business stand point, that it will be a step in the right direction when it comes to their customer’s health. For more information on the SWAT program in Okeechobee County, contact Courtney Moyett at cmoyett@quitdoc.com.